I live in the country, which is located in a small town. Small town, country living is absolutely wonderful and simple. Haybales, barefeet, bonfires, friends, laziness. There is definitely a lot of wildlife in the country. So much so that I have dreams about bears knocking on our windows (I have really eccentric dreams, from knocking bears, to evil mothers, to nuclear bombs...). 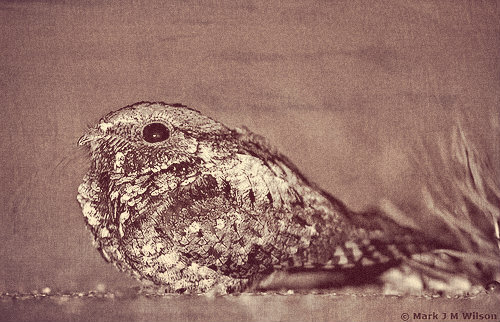 Apart from horses, goats, dogs, cats, and crows there is the whippoorwill. Whippoorwill's are birds that have a very monotonous melody that lasts from night to early morning. For unknown reasons our whippoorwill chooses a tree right near our window, echoing his call throughout our house and sometimes keeping us awake at night. When awakened by his melody and your eyes pop open your immediate thought is, "What possesses a creature to sing all night, non stop?!" A thought that helps erase the annoyance of this creature's monotonous song is the knowledge that it isn't singing every night to make the human race loathe him, but that chirping away all night is his own way of praising his Creator.With that thought, one can get past his raucous....... almost.